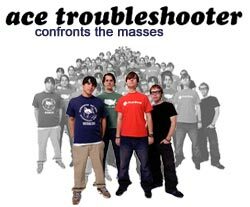 Ace Troubleshooter surprised punk fans everywhere with the accessible sounds of their self-titled debut in 2000. Lead singer and the brains for Ace, John Warne, gave us a few moments of his time recently to answer the following questions. 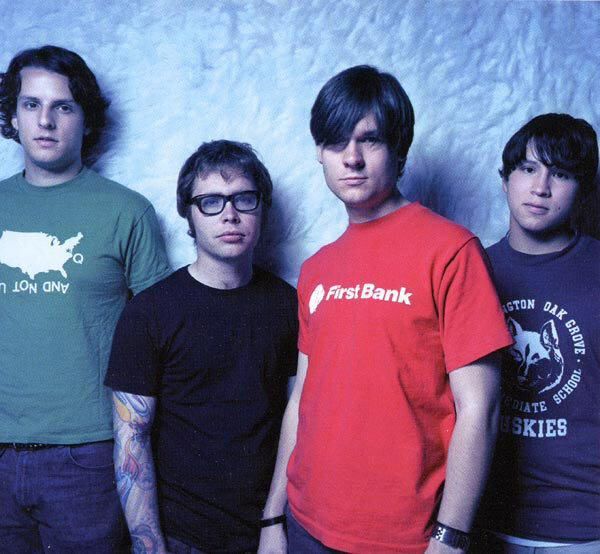 This interview took place on: 8/20/02. JFH: How did you guys come up with the name "Ace Troubleshooter"? John Warne: I read it in a history book and thought it sounded cool. Jesus freak Hideout: What has inspired the shift in direction for the band's sound and songwriting from your debut project to your latest album The Madness of the Crowds? John: There was no inspiration for a shift. I just write what seems to come out of me, and I'm fairly indiscriminate. The songs on the new album are just more rock/pop, but still Ace. JFH: What is the story behind the song "2:00 Your Time?" John: I wrote this song from the perspective of the main character Pip in Dickens' "Great Expectations." He is smitten with this girl Estella, but she doesn't doesn't return the feeling. JFH: Can you tell us a little about the song "Numinous?"" John: Every culture has a conception of God or a ruling deity. A spiritual force so supernatural it inspires awe and fear in the hearts of man. The mighty spirit that evokes this kind of experience is called the Numinous. Christianity understands this to be Yahweh, and the human incarnation of the Numinous is His Son, Jesus Christ. This song attempts to convey a certain shrinking, an awe and profoundness we feel when we truly encounter God on His terms, and it is a crushing and yet tender experience. JFH: What is your favorite song from The Madness of the Crowds? Also, what is your favorite all-time Ace song? John: My favorite on Madness is "Numinous" because it is so deeply worshipful to me. My favorite Ace song, however, is called "Tonight" and it's on the last CD, the self-titled one. JFH: Any studio stories while recording The Madness... at the Loft in Michigan? John: Yeah, we were recording one night and suddenly the lights went out and aliens came and recorded a few vocal takes. On the fourth track, "Amanda," it's one of them singing backup. Eerie. JFH: Although our current culture has been inundated by this subject, it's naturally something that has changed our nation forever. Where were you when you heard about the terrible events of September 11, 2001 and how did it effect you personally? John: We were a few miles from the place the fourth plane crashed, the one that didn't hit its target. We played a show a few nights later about 45 minutes from ground zero, NYC. Apart from it being a total tragedy, it furthered my conviction that a lot of people see America as this great evil, and I somewhat agree. Instant gratification and immorality seem to define us as a nation, and it's time we Christians start living as we ought to. JFH: How has touring extensively shaped who Ace Troubleshooter is today? John: It's made us tighter, more entertaining (hopefully :)), and more cohesive as a whole. When you spend that much time with a group of guys you realize you need to define who you are and who you want to be as part of the group. John: When our van caught fire and we had to put it out with Mountain Dew. It was just lucky we had 8 24-packs on board. JFH: What albums are currently in your CD player? John: Billy Music - Midwest Index and John Reuben - Hindsight. John: I liked Star Wars a whole lot better since I was never really a Spider-Man guy. Yoda is the man... or... whatever he is. John: I really like The Power of One. It's good. JFH: What is your favorite thing to do in their spare time? John: Twiddlin's always a good time. JFH: Do you have any favorite Christian artists? John: No, they're all good. John: Be excellent to each other and party on, dudes!